What’s all the blue stuff in this picture? The picture is of the Bavarian town of Stadtsteinach in the Frankenwald, about a four-hour train ride from the airport in Frankfurt, Germany. The town is described by Thom Hartmann in his book Rebooting the American Dream. Here’s how Thom describes it. Given that Germany is one of the cloudiest countries in Europe, right up there with England—the sun shines for only about a third of the year—it seems crazy that it would have more solar panels per capita than any other country in the world and that it employs more than 40,000 people in the solar power industry. But the Germans made it happen. panels on their houses. They then passed the Renewable Energies Law (Erneuerbare-Energien-Gesetz) and in 2004 integrated the 100,000 Roofs Program into it. The Renewable Energies Law mandated that for the next 10 years the power company had to buy back power from those homeowners at a level substantially above the going rate so the homeowners’ income from the solar panel would equal their loan payment on the panel and would also represent the actual cost to the power company to generate that amount of power had it built a new nuclear reactor. Solar Hill, on Western Avenue has started the ball rolling. 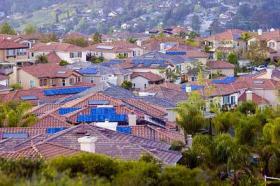 Here and there I see solar panels popping up on local homes. The Brattleboro Town School Board has agreed to take part in a community solar project that will provide renewable solar energy for all of the district’s buildings. (Reformer Friday March 29, 2013). A short trip up route 5 shows several installations on local farms. Winstanley’s project on Putney roar will “put us on the map” as visitors drive by on I-91. Nick Ziter, of Sun-Farm Community Solar, is building a community project, which will be located behind Santa’s Land off of Route 5 in Putney. He wants to build a “solar garden” that can produce 150 kilowatts of energy. GMP Customers in Brattleboro can purchase a panel, or a few panels, and the energy is then fed in to the grid, with the solar power offsetting the home’s energy use. According to Chris, the Town plans to purchase solar power as part of a recent agreement to save money. The future is “bright”! 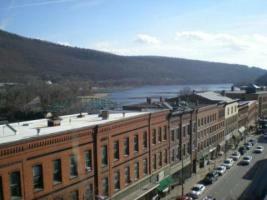 Can we make Brattleboro the Stadtsteinach of Vermont? Thanks for posting this tomaidh. This is the kind of story that gives me a positive outlook for the future. The German example is a good one and I think Brattleboro will follow them. At the same time I’d like to see VT explore a parallel low tech energy model – hydro, non photovoltaic panel solar, small scale wind. I don’t think we should be so taken with technologically advanced approaches that we spurn the old ones. Quote” “At the same time I’d like to see VT explore a parallel low tech energy model – hydro, non photovoltaic panel solar, small scale wind. I don’t think we should be so taken with technologically advanced approaches that we spurn the old ones”. Absolutely! Remember, if it doesn’t use carbon fuel, the cost of fuel will not go up with time. There are a few opportunities here in Bratt. For example, The Whetstone, behind the Shell Station (by the Deli) at Williams Street has a gorge with sufficient height for small scale hydro. The reservoir at Chestnut Hill could be used for pumped storage. There’s been some interest in local combined heat and power (Like at Brattleboro Kiln Dry) but nothing has been able to get off the ground. Possibly run-of-the-river (no dams) hydro in the West & Connecticut Rivers. Investors prefer large projects, but many small ones equal a big one! I’d be on board. In fact, I have a blank area on my south-facing wall where I’d like to put a solar panel — as big as will reasonably fill the space, so the space is used well — and (perhaps) grid-tie it to offset my current and future electric bills. I understand solar panels are cheaper than ever, but I am overwhelmed thinking about how to make it happen on MY house for cheap. It needs to be easy, accessible, affordable for people. I’d love a program where the money was financed through the power company and the payment made via the credit applied to the homeowners bill, so the panels would literally pay for themselves over time. The loan would be transferrable to subsequent homeowners and always just paid via the electric bill’s tally. When the loan (perhaps with interest, in order to incent the investors) was paid off, the array would then belong to the homeowner free and clear, who would at that point reap the financial benefit. Has this been done elsewhere? You’d just sign up through the power company and they’d send a crew to do the installation. Could be a good investment vehicle for local investors who would be in it for the long haul but would get reliable long-term interest on their investment. Maintenance would be on the power company, but I assume even with the smart meters they will need to check them periodically (yearly?) for maintenance, so the solar panel(s) could be checked at the same time. If that sort of thing gets offered, sign me up!